The outlook for real estate returns in the face of expected interest rate increases is understandably a current focus point for many investors. 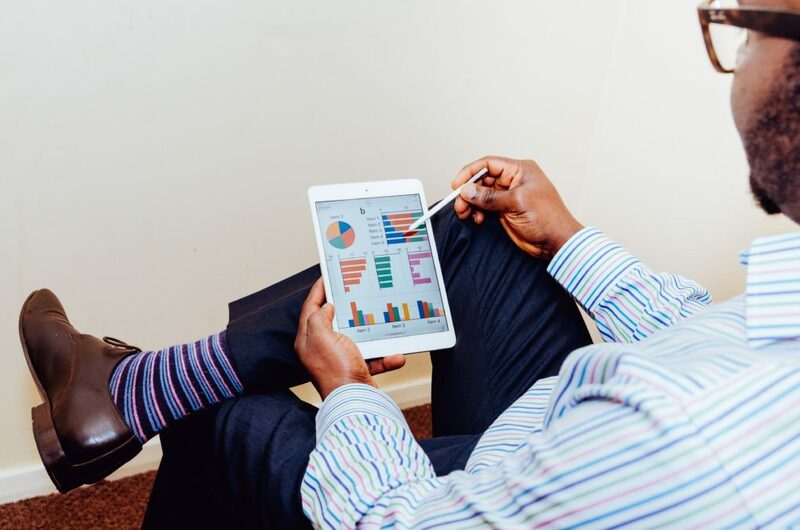 Conventional wisdom and the narrative that is most commonly encountered is that rising interest rates is the Achilles heel that will bring about the end of the current real estate cycle. It is undeniable that listed real estate returns have recently become more sensitive to interest rate movements, as compared to historic sensitivities. The potential reasons for this are numerous and beyond the scope of this report. However, we have a suspicion that historically unprecedented ultra-accommodative monetary policy, and the resultant artificial low cost of capital, have played a significant role. In a world that was starved for yield more investors turned to other yielding securities, including REITs, for the income they used to receive in the bond market. In a normalised interest rate environment, it is probably not unreasonable to think that investors in the listed real estate market will again focus more on the long-term total return prospects (income + growth + price return) and place less emphasis on the initial yield. 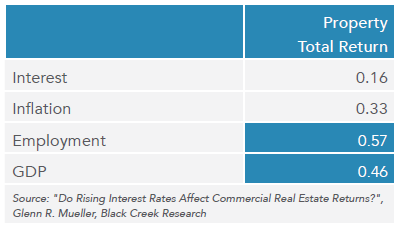 To gain a big picture overview of the impact of interest rates on real estate returns we thought it worthwhile this month to highlight the findings of a few recent studies that look at historical data. Using return data over 40 years from the National Council of Real Estate Investment Fiduciaries (NCREIF), Professor Glenn R Mueller from the University of Denver examined the correlations of real estate returns with major macro-economic indicators, including interest rates. Professor Mueller specifically contrasted the returns between periods of rising versus falling interest rates between 1977 and 2017. The first thing that stands out by looking at this data is that the average total returns from commercial real estate have been significantly HIGHER in periods where interest rates were rising, both in nominal and real terms. This illustrates that the underlying reasons for interest rate rises matter more than the direction of the change. As can be seen from Table 1, during rising interest rate periods GDP growth, employment growth, and inflation were also higher than compared to periods with falling interest rates. 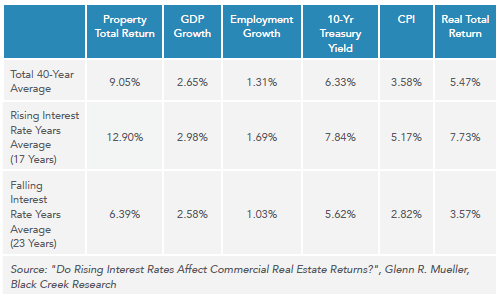 Table 2 illustrates that employment growth, followed by GDP growth and inflation, have had a significantly higher impact on total returns from commercial real estate than interest rates. This makes sense intuitively; when the economy is growing, tenants are also experiencing economic prosperity and the demand for real estate space is robust. If supply of new real estate does not outstrip the demand, landlords can charge higher rents and hence grow their income from real estate operations. Real estate has long been recognised as an effective inflation hedge. Rising replacement cost values, as well as inflation pass-through stipulations in lease contracts, result in returns that can keep up with general inflation. Critics might be correct in pointing out that the above data might not be entirely applicable to returns in the listed real estate market. 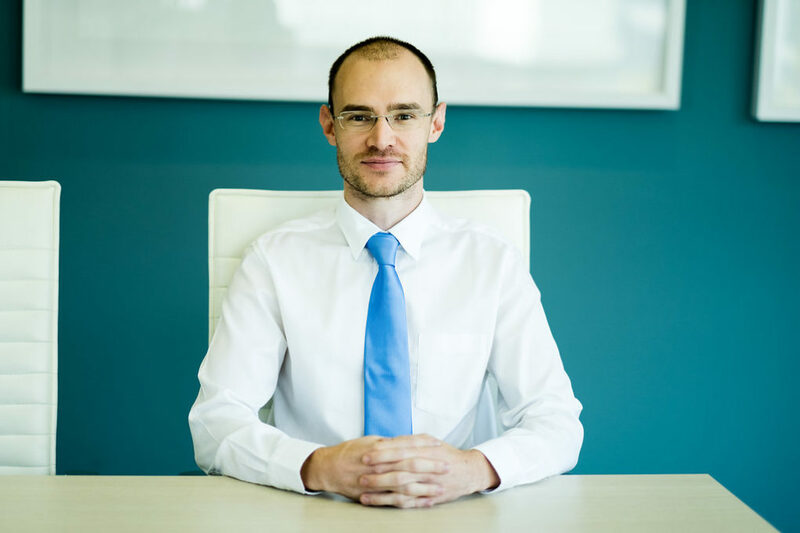 Direct and private real estate investors tend to be buy-and-hold investors that hold investments over long enough periods for the correlations above to materialise. In an interesting research report titled “REITs in a Rising Interest Rate Environment”, CBRE Clarion Securities examined US REIT returns during and after periods of rising interest rates from June 1994 until February 2018. Table 3 summarizes the average results from 9 separate periods of rising interest rates. The results from Table 3 seem to indicate that the negative short-term knee-jerk reaction from investors in the listed real estate market is often overdone. Higher interest rates frequently go hand-in-hand with stronger economic growth, higher employment, and higher inflation, that result in stronger real estate fundamentals and hence stronger long-term total returns from REITs. A recent report by the National Association of Real Estate Investment Trusts (NAREIT) in the US corroborates the findings from the CBRE report above. Chart 1 plots the one-year total returns of the FTSE NAREIT All Equity REIT Index with the one-year change in US 10-year Treasuries. REITs had positive returns in 87% of the rising rate periods, with most returns being double digit. 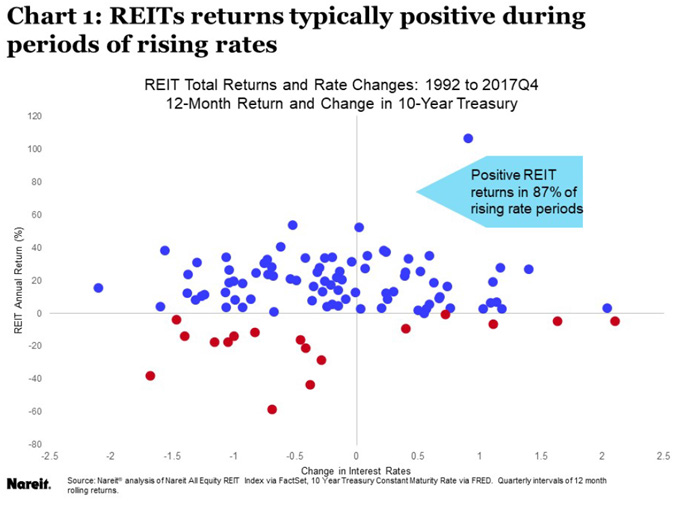 The same NAREIT report also indicates that REIT total returns outperformed that of the S&P 500 in more than half of the episodes of rising Treasury yields over the period. Finally, it is also important to consider where current valuation levels are relative to historical norms. Compared to fixed income, listed real estate currently trades around the historical average spreads in the US. The implied cap rate spread over the 10-year Treasury is around 270bps for US REITs. This is in range with the historical norm and nowhere near the sub 100bps spread that was seen during 2006 and 2007. In Europe, the spread between listed real estate and fixed income is currently significantly higher than the historical average, admittingly from unprecedented low government bond yields. The implied yield spreads of European listed real estate to local bonds are at least 100bps higher than that seen in the US, providing a reasonable buffer in current pricing for bond yields to move out before getting back in line with historic norms. 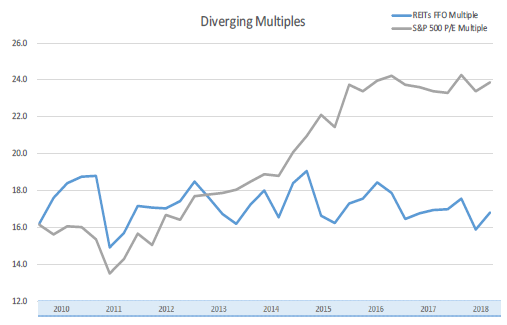 Comparing US REIT FFO multiples with that of equities (S&P 500) paints an interesting picture. It is peculiar that so much has been written about the potential risk of rising rates on REIT returns, but that there seems to be much less concern about the outlook for general equities, despite the difference in current valuations. Trying to time the market by predicting interest rates is a fool’s errand. History indicates that a more prudent approach being to allocate capital to listed real estate when reasonable long-term real return opportunities are available in the market. Real estate fundamentals overall remain healthy, mainly due to manageable supply levels relative to demand, with an improved economic growth outlook. Taking the estimated forward FAD (Funds Available for Distribution) yield of 4.89%, and medium-term growth prospects into account, listed real estate currently looks fairly valued on a risk-adjusted basis. For our full Market Report, please visit our Monthly Market Reports page.